When it comes to keeping a journal, you may be inclined to think it takes too much time, too much effort, or only makes sense if you’re actually a writer. Not so! If each of us knew the great benefits of journaling, we’d think again about picking up a notebook and pen. Here are four reasons you should keep a journal . . .
Studies show that the emotional release that comes from journaling lowers stress and anxiety and promotes better sleep. Journaling also helps you to express yourself and increases your awareness of self and others. Since expressive writing helps you to process your thoughts and emotions, it’s no surprise that it also helps to boost your immune system and attain greater peace and calm. 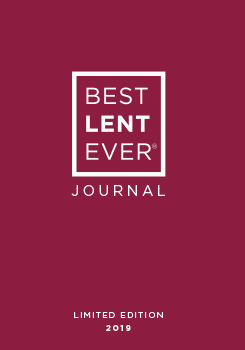 Filled with inspirational quotes, this journal is a powerful companion for your spiritual journey this Lent. Whether you possess a mind like a steel-trap or a mind like a sieve, journaling helps to preserve moments, reflections, and life events that might otherwise be forgotten. The act of writing something down sears it in the mind, and re-reading it later not only helps you to recall it, but often triggers other memories associated with it. Retaining and recalling the special moments of our lives becomes more and more important as we age and a journal can make sure nothing is lost. Writing down your thoughts and experiences not only helps you remember them, but to also come up with new ideas. Writing regularly allows you to process and communicate ideas, which leads to being able to see things in a new way. Julia Cameron, author of the best-selling book The Artist's Way, encourages something called “Morning Pages” which is three pages of long-hand, stream-of-consciousness writing first thing in the morning. Many who write morning pages claim that it unlocks thoughts and ideas they never knew they had. No matter what time of day you journal, it will help to spark your creativity. The very act of setting aside time to journal is an act of discipline. And becoming more disciplined is like working a muscle – the more you do something, the more disciplined you become. Habits like daily journaling have a way of helping you to improve other areas of your life – from keeping your desk tidy to making time for prayer. If you’ve never considered keeping a journal, these are just a few reasons to give it a try. After all, who doesn’t need more creativity, healing, and discipline in their life? Not sure where to get one? You can try TJ Maxx, Barnes and Noble, or you can get a free one, here (just pay shipping)!